There are forum’s all over the internet and the cover all sorts of subjects from antiques to zebras! If you would like to create a forum on a specific subject its not as hard as it may sound and you can even make money with your new forum! I bet that makes you even more excited about building your new forum but how do you get started and what is it going to cost you? First, lets talk about the cost of building a forum. There are many great sites out there that will cost you any where from $25-$5,000 that will provide you will a great point and click type forum and there are many similar sites out there that are free although you will have to put up with a little of their own advertising here and there but its not too bad. So once you have figured out if you want to spend money to build your new forum or if you would rather not spend a single dime then its time for you to move on to step two. The next step is figuring out what your topic is going to be and what sorts of things you want to cover with that topic. For example, lets say that you want to build a forum about dogs, some of the sections that you might want to create are going to be things like Dog Breeds, Training Tips, Feeding, and Accessories. So now that you have an idea of what your forums topic will be and the types of sections that your going to have in it you will want to give your forum a name! I suggest that the name has something to do with the main topic of the forum, such as, Dog Lovers Place. Once you have all of that set in place then your really ready to get started. Now before you start letting people know about your new forum you will need to add some content. 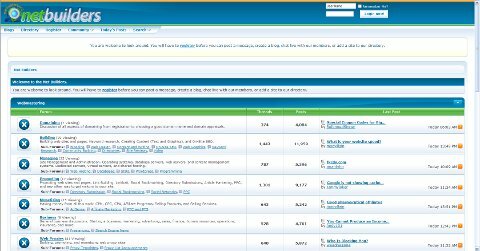 Do some research on your forum topic and the different sections that you would like to have and start creating content for your forum. You will need to have at least a few postings in each of your subjects before you actually let people into your forum. Now that you have your forum created and you have some content you can start letting people know about it. I suggest telling friends and family that you think might be interested in it as well as posting a link to it on any social networks that you belong to. You will be surprised as to how fast word will spread. I bet your wondering about what I mentioned about making money with your forum aren’t you? There are several ways to make money with your new forum, the easiest is to sign up as an affiliate with a company that sells products that people that will on your forum might be interested in. Such as, if your forum is about dogs then you might want to become an affiliate of a pet store. Once you’re an affiliate you can post to your forum about a product that they sell that you like that has to do with your forums topic and include your affiliate link in that posting!